You heard it folks. 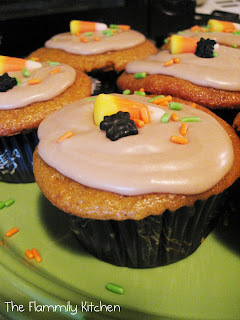 My sister gave me the idea to make pumpkin cupcakes since she knows about my pumpkin addiction, so I had to make them. I mean common, they're made with PUMPKIN! & Derek's favorite doughnut (I think) are maple bars so I decided to make a maple frosting for the top of them. These things are SCREAMING fall! Using an electric mixer on medium-high, cream butter and sugar together until light in color and fluffy. Turn mixer down to low, and add egg and yolk. Beat well to combine. Next, add 1/3 the flour mixture, then 1/2 the pumpkin mixture, another 1/3 of the flour mixture, the remaining pumpkin mixture, and the last 1/3 of the flour mixture, mixing to combine after each addition. Fill baking liners about 3/4 full (I always use my large cookie scoop for this). If you've filled all 12 baking liners and still have more batter, you can fill standalone baking cups 1/2 full with batter. Bake 25-27 minutes OR until a toothpick inserted in the middle comes out clean. Cool 3 minutes in pan, then remove from pans to wire racks to finish cooling completely.